I cleaned my closet yesterday. I didn't mean to. I've been working on the endless office project. But because I've been so focused on that, I'd been careless about piling clothes all over the room on the bureau. And so, since I'm going to New York on Wednesday and would soon need to pack, I thought it was time to put clothes away. One thing led to another and soon I was in the midst of a massive clearing. But this wasn't just any clearing. I go through my closet every couple years or so, then wait for it to get really bad before I do it again. 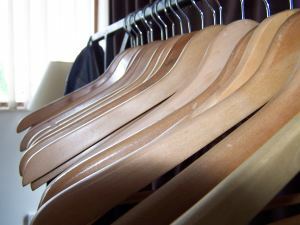 However, throughout every closet clearing there has always been an "untouchable" area full of clothes with such emotional meaning that there's no way I could ever give them away. You know, like the floral dress I wore when my beloved late father took me to a meeting of Rotary and I was the only one not wearing dark blue or black in the whole room. Or the jacket–white, with lavender trim–I bought on my honeymoon at Les Printemps in Paris. Or the blue batik skirt I made a couple years after my daughter was born, in a size it'll be a miracle if I ever wear again. Clothing I was never, ever going to give away. Ever. Suddenly it was just okay to let those things go. Maybe it was the thought of saving my children the grief of someday in the far future finding this stuff in my closet and wondering why I'd hung onto it. Maybe it was the realization that these items weren't doing me or anybody any good in the back of my closet. But there I was, pulling arm loads of them out and putting them in the Goodwill pile. Today I feel about seven pounds lighter. I'm making room, and not just for new clothes. (I rediscovered so many things I'd forgotten I don't really need anything else.) I'm making room for new ideas, for new stories, for new opportunities. For a whole new novel that is wanting to come forth. For new energy, new life, new enthusiasm. How about you? What do you need to clear space for?